Now in Even More Languages! 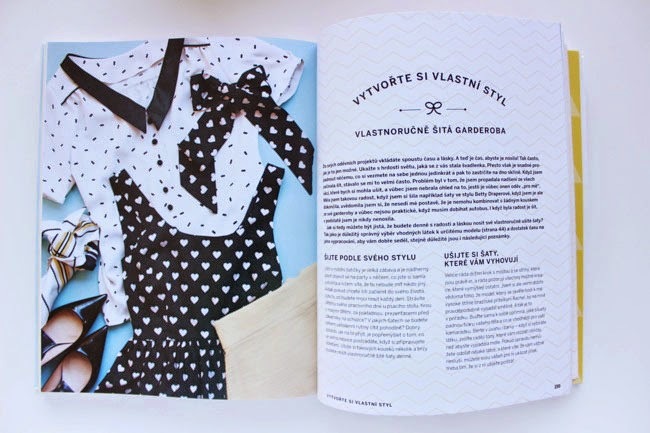 Exciting news - you'll soon be able to get hold of my book about making your own clothes in four more languages - Finnish, Danish, Czech and Swedish! As far as I can tell (alas not being able to speak these languages), the only differences between the books are slight changes to the covers and back covers. It's interesting to see how publishers in different countries tweak them slightly to their preference and what colours and styles they think will go down well in their country. 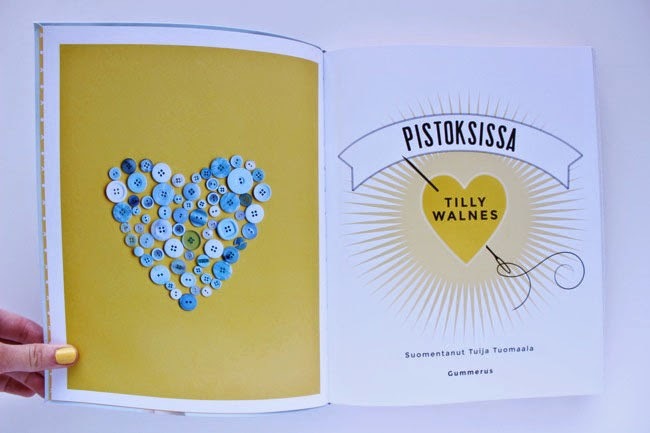 And the Swedish edition will be available from 5 March 2015. If you know other places to buy the book in these countries, do leave a link in the comments. Thanks so much! The book is also available in UK English, North American English, Dutch and German. And there's at least one more foreign edition in the works for later this year - I'll let you know when I know more about release dates. Still keeping my fingers crossed for French and Japanese editions! I made another Francoise dress! The fabric is a low-stretch medium weight knit with a textured surface - it's a cheapo find I scored ages ago from my local, Simply Fabrics in Brixton. In fact, you might recognise it from one of my favourite Coco tops. The result is a lot drapier than versions of the dress made in a more structured woven fabric such as gabardine. The knit fabric doesn't hold the shape of the skirt so well - which isn't a bad thing, just a design feature to be aware of when choosing your material. Fabric like this is a good option for the raglan sleeved version as the stretch allows you to move your arms easily. It's a lovely thing to wear if you want to look put together but want to feel comfy at the same time :) I should probably wear a slip to go under this next time - the photos are showing up every lump and seam of my underpinnings, oops! The stretch in the fabric gives the dress more ease, so I took it in a bit at the sides, and I'm going to have to restitch the zip because it's become a bit loose at the back. I think Emmy left the zip out for her double knit Francoise dress, but I didn't want to risk not getting it over my head! 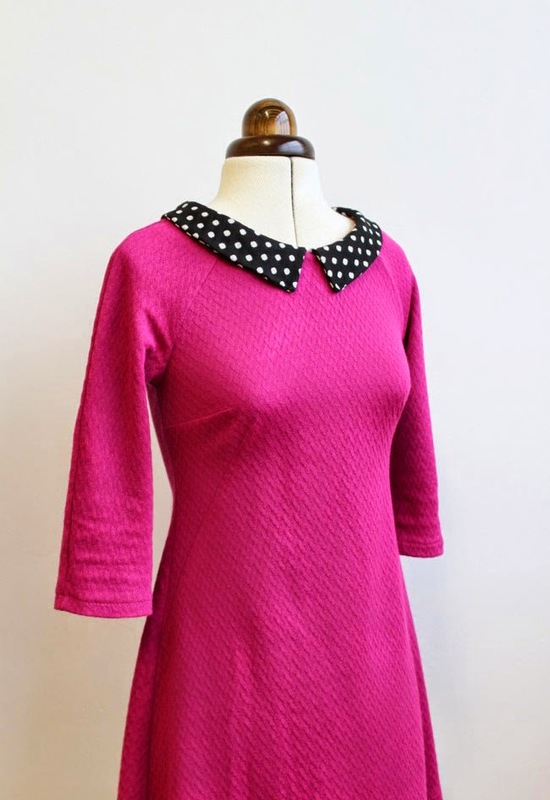 The collar is made in some leftover fabric from the cream polka dot Francoise dress that features on the pattern cover - yes, the fabric is reversible! I bought it from Goldhawk Road - I'm not sure of the exact consistency, but it feels kinda like a malleable-yet-firm woven double gauze, if that makes any sense. Next up, I'm tempted to try making the Francoise dress in a soft denim. Maybe with some visible topstitching around the seams? And maybe even a gold denim collar! What have you been making recently, please? 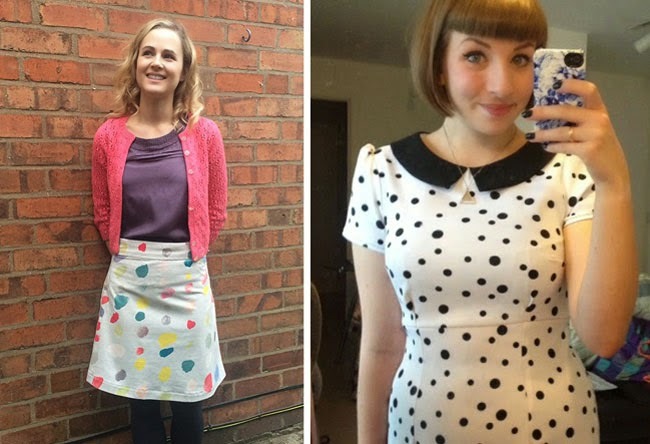 It's my favourite time - time to look at some of the gorgeous things you've been making with T&TB patterns recently! 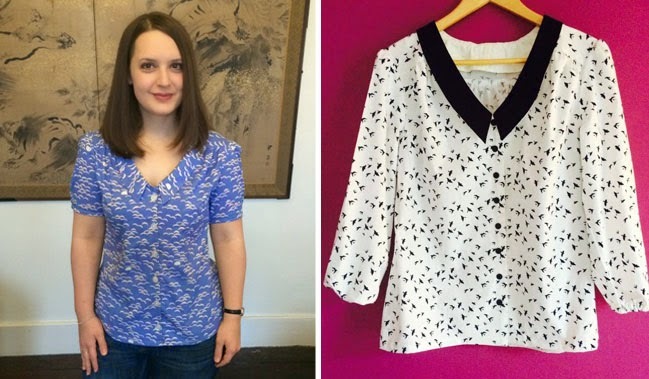 Jo's new favourite blouse is Mimi from Love at First Stitch, sewn in this cute Atelier Brunette fabric. Verity swapped the short pleated-hem sleeves that come with the pattern for longer sleeves - I'm so going to copy this idea! 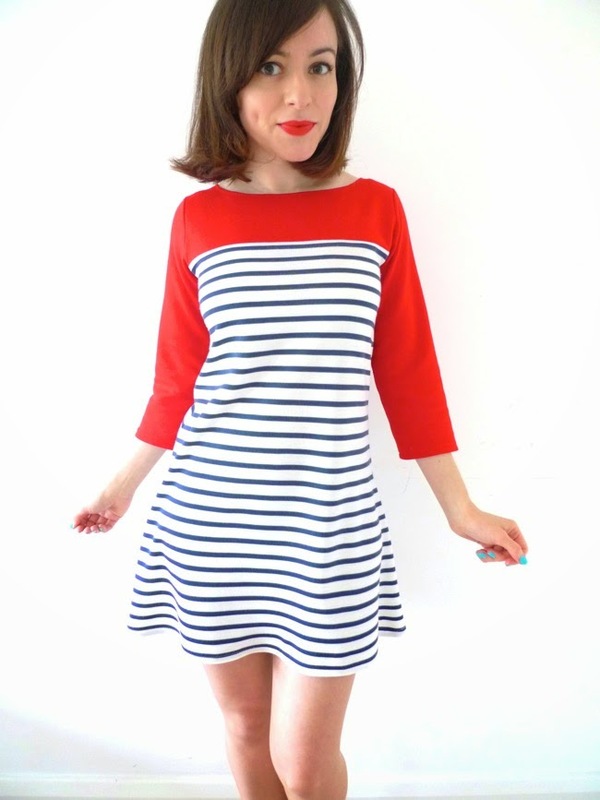 You can't beat a Breton stripe dress. 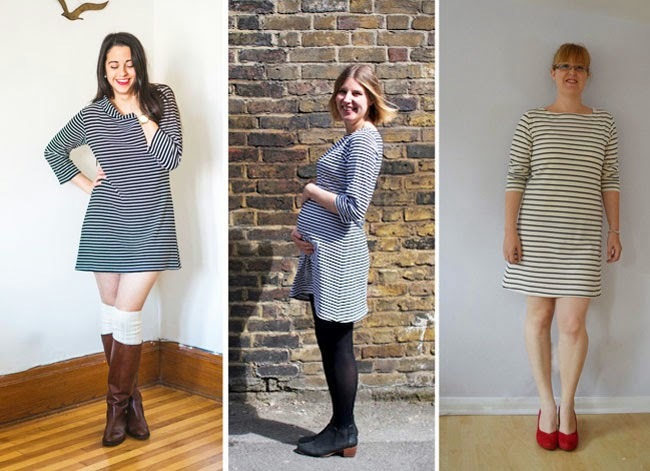 Heather added the funnel neck option to her second version of the Coco dress; Chloe is teaming her stripey pocket version with her growing baby bump; and Freya has kept her Coco classic - it looks awesome with those red shoes! 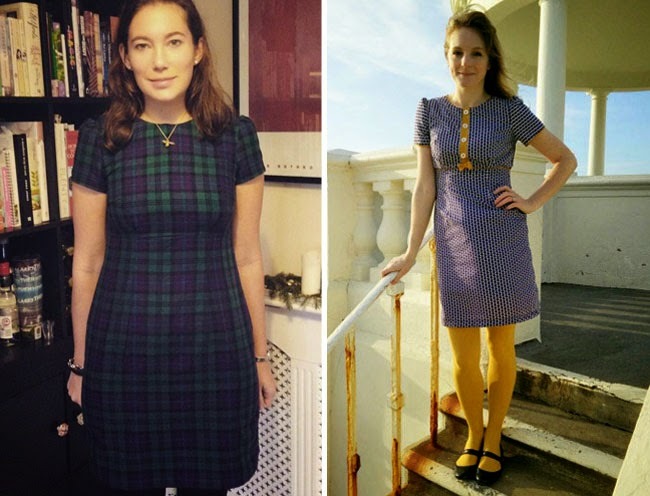 Somehow the Megan dress (pattern also included in Love at First Stitch) looks good on everyone, and this tartan version by Laura is no exception - such a great style for the office. Lou snazzed up the empire waist bodice on her Megan dress with a little faux button placket and bow - cuteness alert! 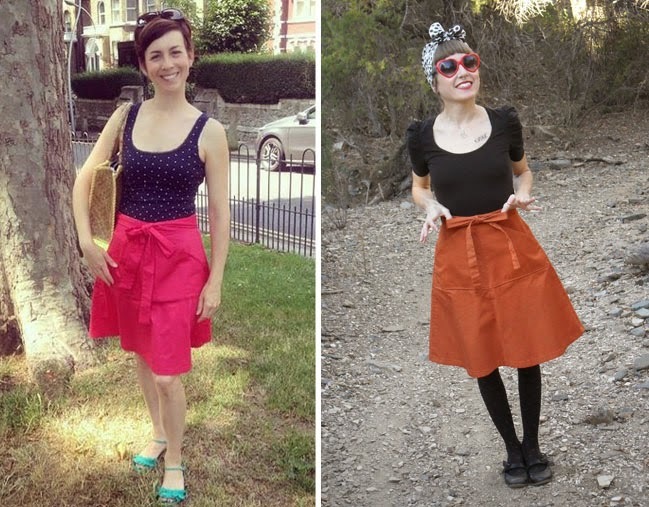 The Miette skirt pattern is super duper easy to make and looks really cute on - as evidenced by our models with the infectious smiles, Leigh and Erin. I love how they've both styled the skirt, it looks great with a close-fitting jersey top. Another gorgeous Mimi blouse, this one made by Leigh - such a pretty colour palette. Pauline used a nautical print for her Clemence skirt, and added gingham pockets. 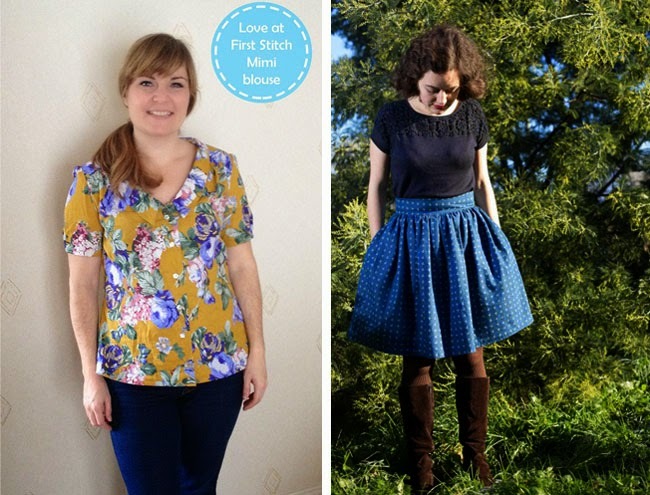 Both these projects are included in Love at First Stitch. 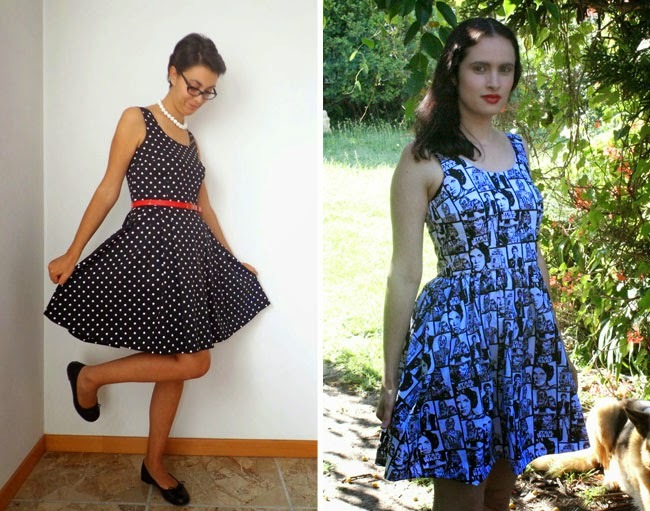 I love the classic style of this polka dot Lilou dress (pattern in Love at First Stitch) made by Tiz - if you look carefully, you can see the pleated panels running down the sides. And how adorable is this Star Wars version by Amelie & Atticus? Click through to see the full Vadar Chic look! Monika made the Mathilde blouse in a drapey navy mystery fabric - the solid colour really shows off the tucks down the front. 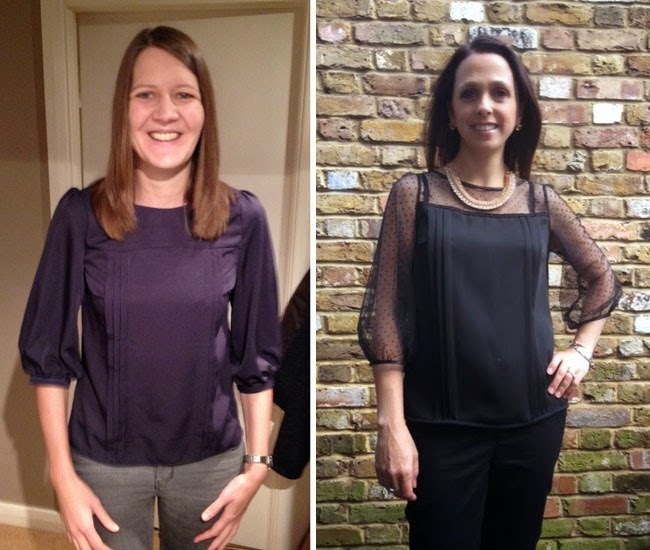 Katie was inspired by Julie to use a sheer black fabric on the sleeves - soooo elegant. You can't go wrong with Nani Iro fabric - I love this paint splodge print that Lauren used to make a Delphine skirt. Shauni looks adorable in her monochrome Megan dress - she drafted that collar herself, nice touch! Both these patterns are included in Love at First Stitch. 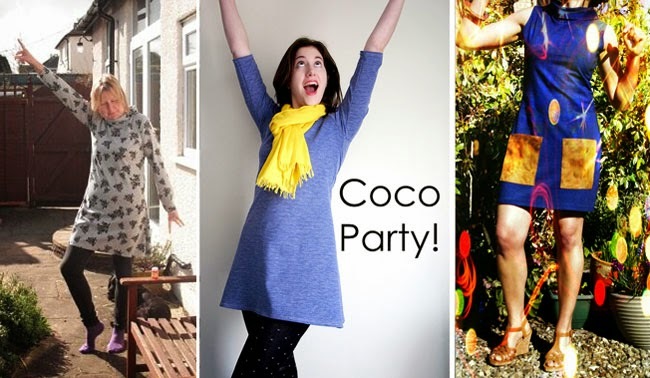 Jen wore Cocos all week long for OWOP (the 'One Week, One Pattern' challenge). I particularly love the red and stripe design of this one - very Boden, non? 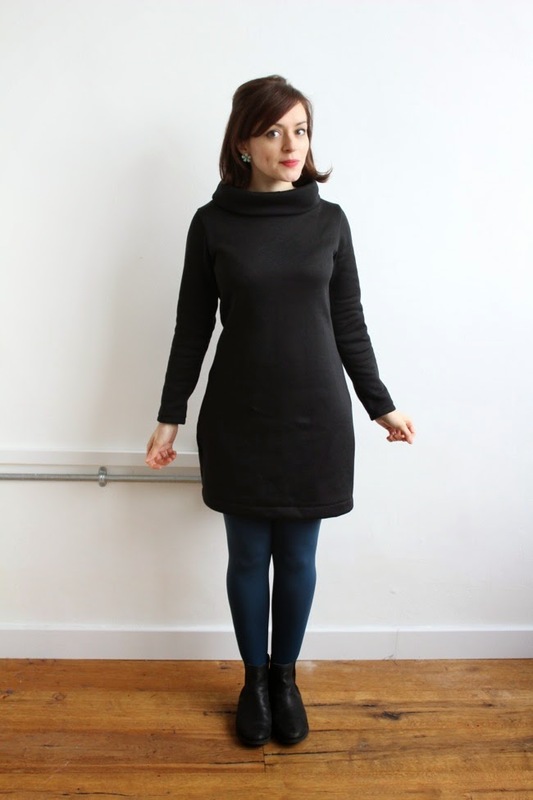 Sophie used a chevron fabric for her funnel neck top version of Coco - looks ace! Catherine made an adorable version of the Francoise dress in green. 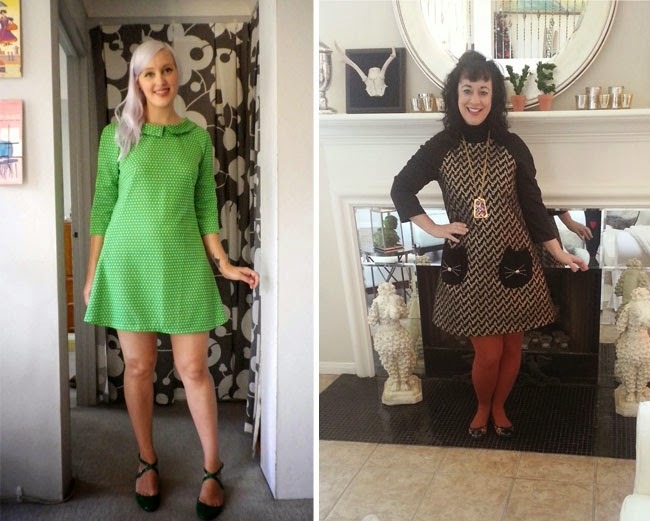 If you don't know her blog, go check it out, especially if you like sixties styles - you're in for a treat. I literally yelped with delight when I saw this version of Francoise by Sandee - check out those kitty pockets!! 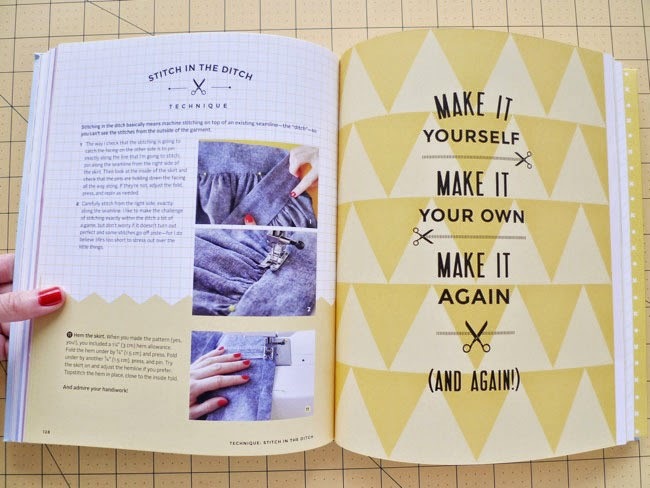 I don't know about you, but I'm feeling so inspired to sew right now! There's loads more inspiration in the Maker Galleries on Pinterest - go see what people have been making. 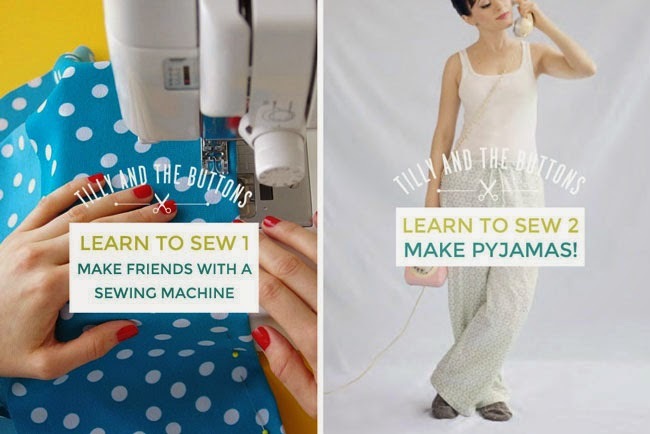 If you've sewn something with a Tilly and the Buttons pattern, send us your best photo for the Maker Gallery - you can tweet us, email us or send us a link through this page (unfortunately I can't pin from Instagram). We can't wait to see! I started with the Stenstorp kitchen island, bought from Ikea (of course). I wanted a table high enough for cutting patterns and fabric while standing up - this one is 90cm high, which is perfect for me. FYI the surface is 126cm x 79cm. It's nice and sturdy, with a gorgeous oak top - so great for leaning on - but on the downside it's seriously heavy. 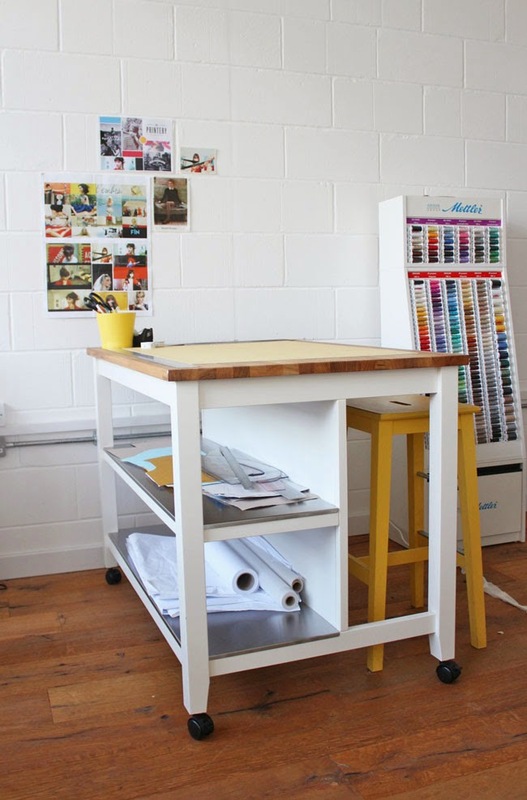 I wanted to be able to move it around the studio - we move furniture around when we have workshops on, and I love moving the table to face the amazing city view out the window when I'm working on it. So (with help from my guy) we sawed off the ends of the legs and replaced them with castors. Wheeeee! 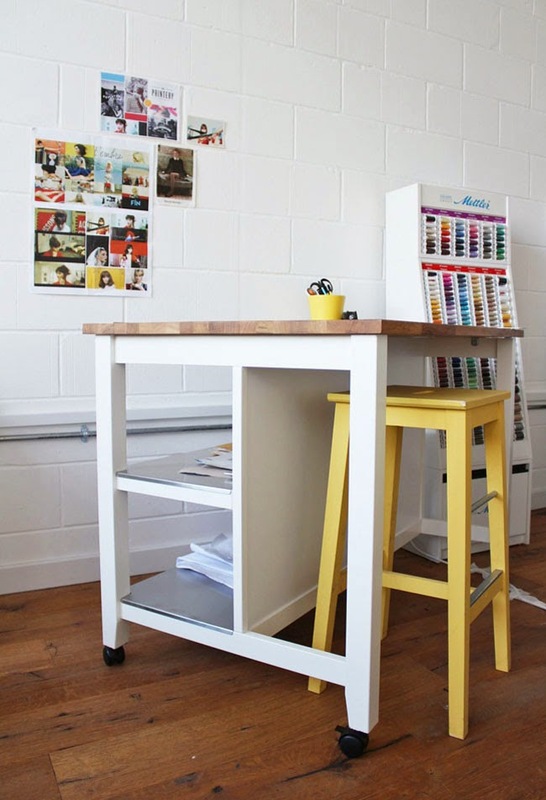 The other great thing about this table is that it comes with storage solutions! 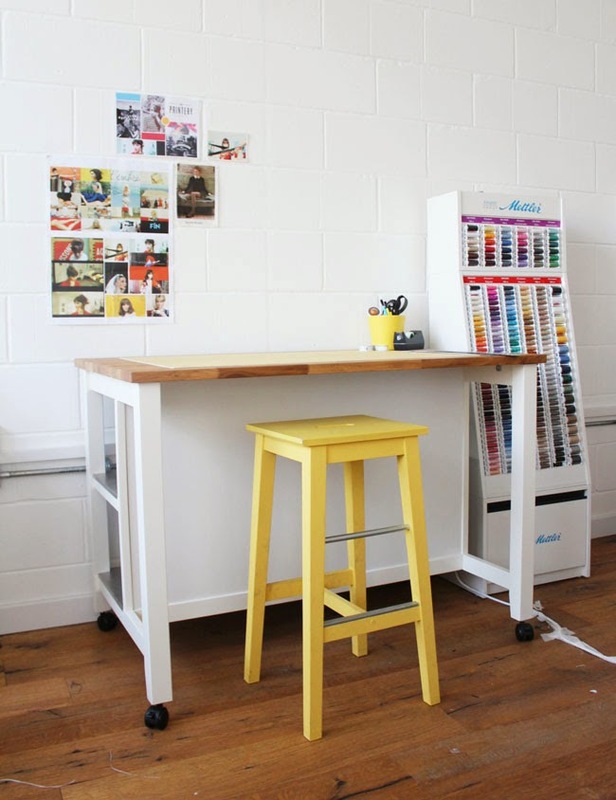 It has two long shelves down one side, the ideal size for stashing drafting and cutting supplies - pattern blocks, paper rolls and long rulers. The other side has space for a high stool underneath. 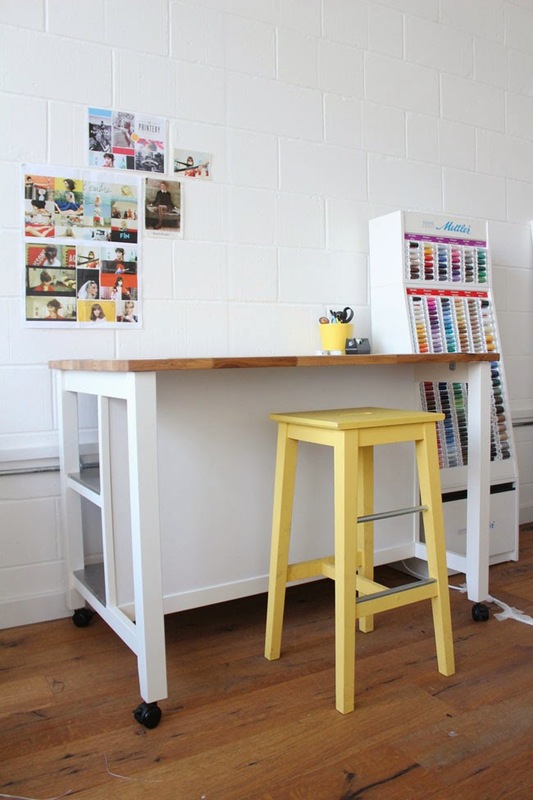 This is just a plain wooden stool that I painted banana yellow. 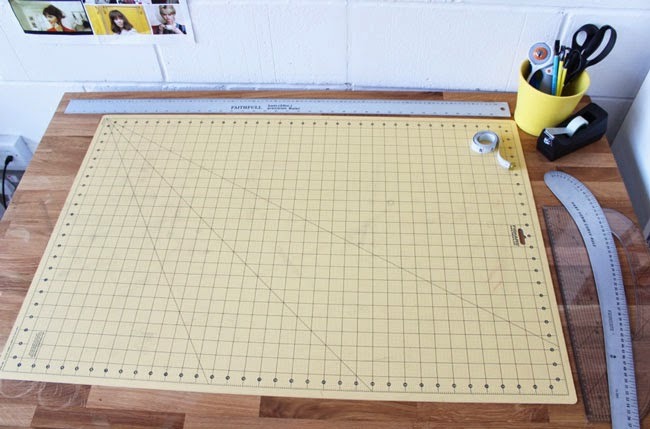 I love my cutting table! 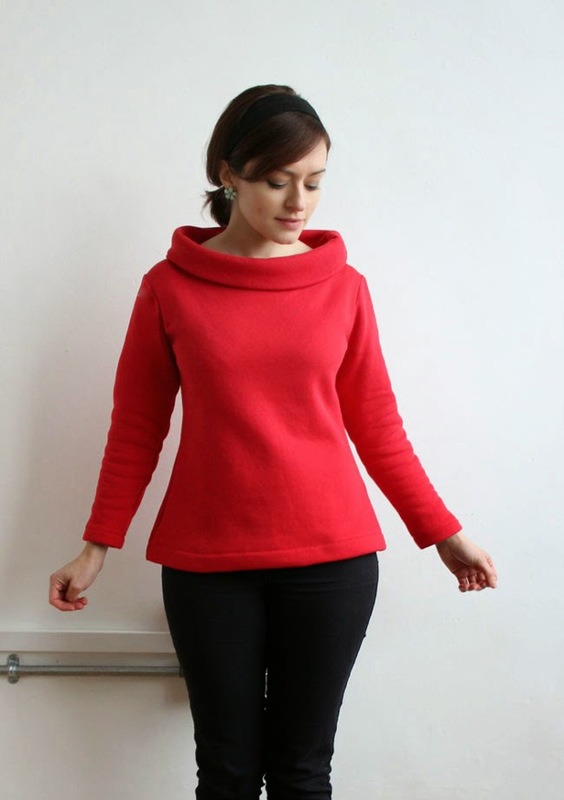 Sweatshirt fabric is lovely and easy to sew with, and will create super snuggly outfits to see you through the winter. 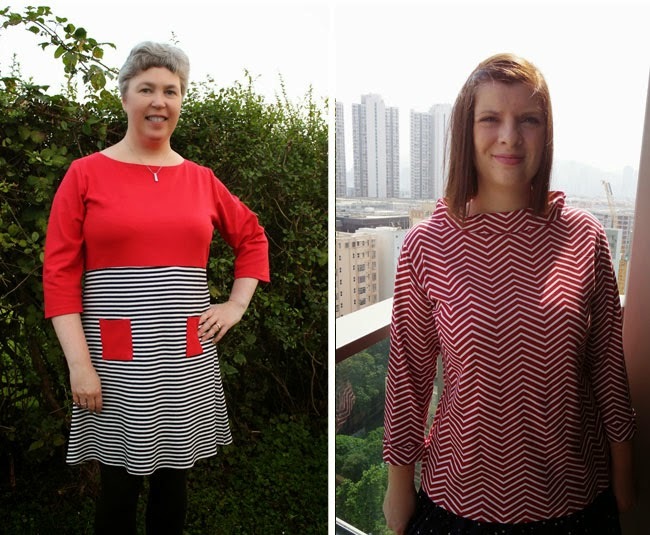 My sweatshirt Cocos have quickly become wardrobe staples, and there are some other cute patterns out there that you may like to try – such as Lola by Victory Patterns, Linden from Grainline, and White Russian by Capital Chic Patterns. 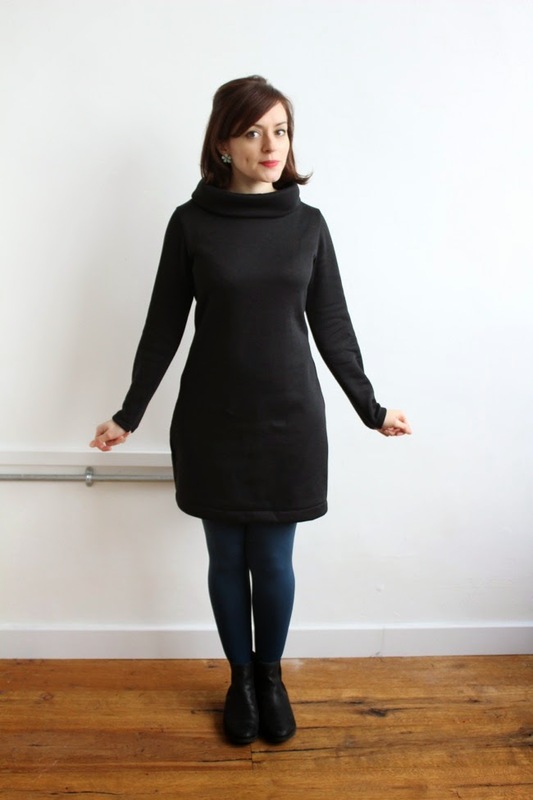 Today I’m sharing some tricks I found helpful for sewing with thick sweatshirt material. 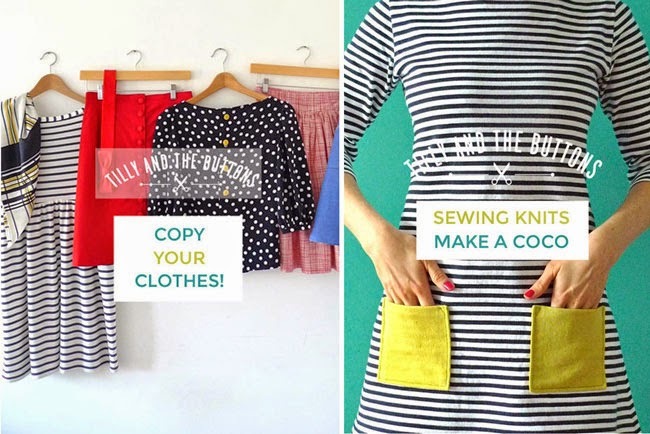 My starting point is my usual method for sewing knit fabric (as opposed to woven fabric) on a regular sewing machine, so use these tips alongside the tips in the Coco sewing pattern instructions and/or our Learn to Sew Jersey Tops video workshop. Sweatshirt fabrics can shrink quite a bit. I discovered this the hard way! 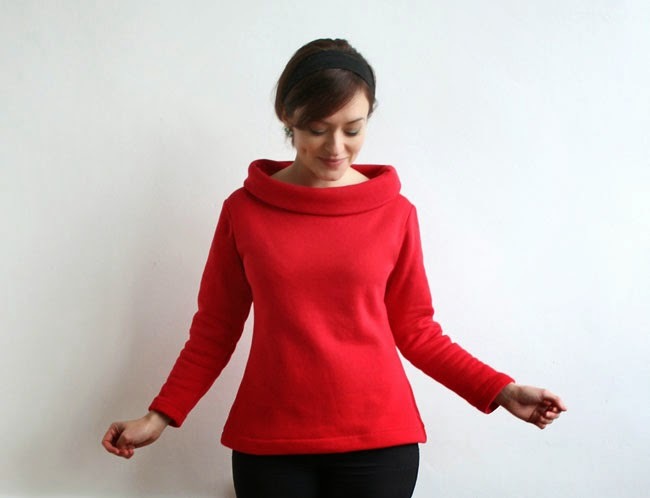 Embarrassing story – my red Coco sweatshirt was originally supposed to be a dress, but the second time I washed it, it became so indecently short I had to re-hem it as a top! So you may want to pre-wash your fabric twice before cutting it out, and also add some length to the hem and sleeves to be on the safe side. For the second (black) version, I lengthened the hemline by about 7cm (3in). As well as lengthening the hem to allow for shrinkage, if the pattern your using isn’t designed specifically for thick sweatshirt fabric, it’s a good idea to increase the length on any area that involves a fold, since thicker fabric needs extra allowance to fold over itself. I found I needed to add about 7cm (3in) to the depth of the funnel neck piece on Coco, since the fold was so bulky. It’s also a good idea to create a deeper hem allowance so the thick hem doesn’t pop out or sit awkwardly. 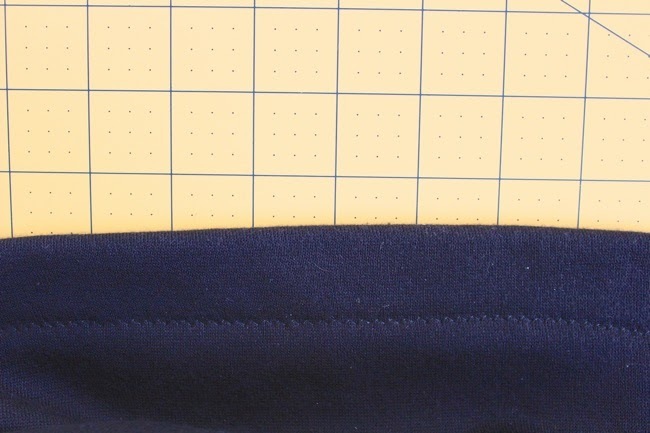 Since sweatshirt fabric can be pretty thick, it helps to reduce the presser foot pressure on your sewing machine so you can get multiple layers under it without too much squidging. Your sewing machine manual will tell you where the presser foot pressure dial is on your model, if it's adjustable. Not so much a must, just a time-saving tip ;) The good news is that I found I didn't need to use my iron much between stitching. Don’t tell me off! Finger pressing was enough to fold most of the seams down neatly enough before the next bit of stitching, and I just gave everything a good press at the end. Hooray! 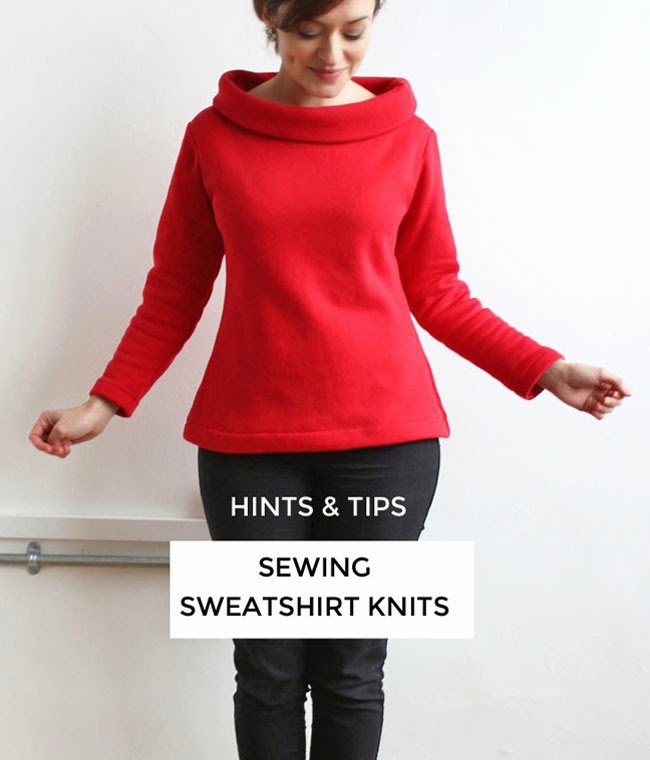 Do you have tips of your own for sewing with sweatshirt knits? Do share! 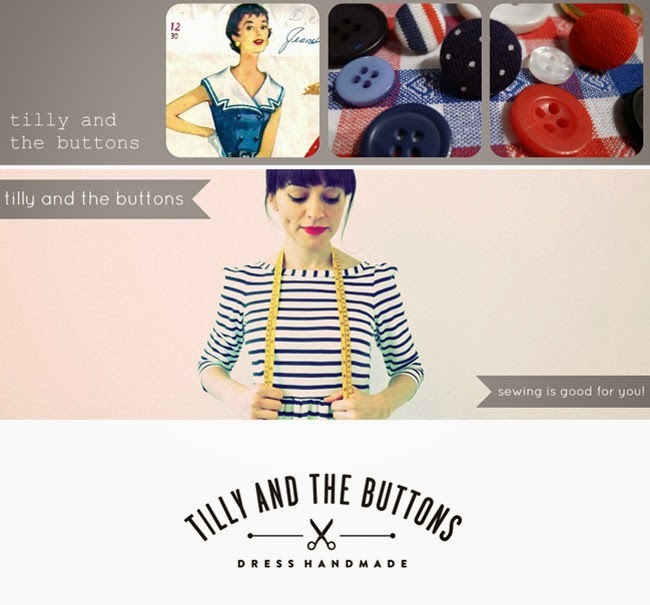 Fancy working at Tilly and the Buttons? 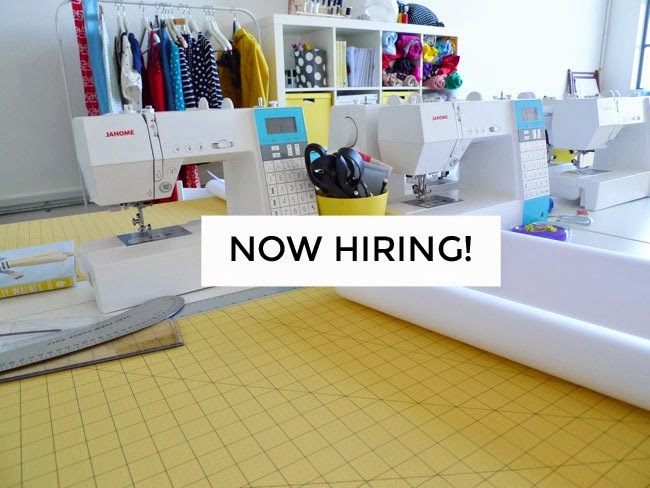 We have a part time job going for a Sewing Pattern and Workshop Assistant! We are looking for an experienced and confident dressmaker, with excellent working knowledge of Adobe Illustrator, to contribute to the creation of our sewing patterns, workshops and blog. The right person will also have a strong understanding of sewing patterns, accuracy and attention to detail, a friendly and professional demeanour, be pro-active and helpful, and have a sense of humour and enjoyment in work. Are you cold? I am. It's freezing in London! I did some emergency sewing over the holidays and now have two snuggly sweatshirt Cocos to keep me warm - one top and one dress. The fabrics, which I bought from Goldhawk Road, are super soft, thick and squidgy, with fleecy insides. I may look like the Michelin man in them, but I don't care - I feel so snug and smug! I also decided to taper the side seams on the skirt part of the dress version, making it straighter than the usual slightly A-line shape. There wasn’t any particular reason for doing this with sweatshirt fabric, I just fancied a change, and a couple of people had asked me how to do it - so here’s how. 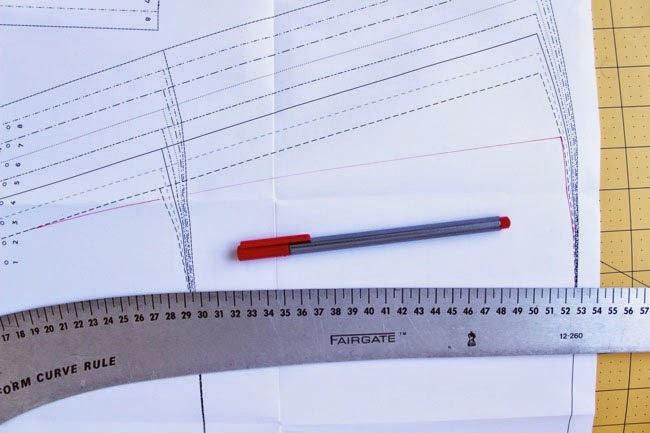 Simply redraw the side seam line on the front dress pattern piece, with a slight curve from just below the hip going into a straight line down to the hem. Square off the bottom corner into a right angle so the side seams will match up in a straight line when you sew them together. Repeat on the back dress pattern piece, making sure the new lines are the same length. And that’s it! These two garments are now on constant rotation in my wardrobe until the season changes! 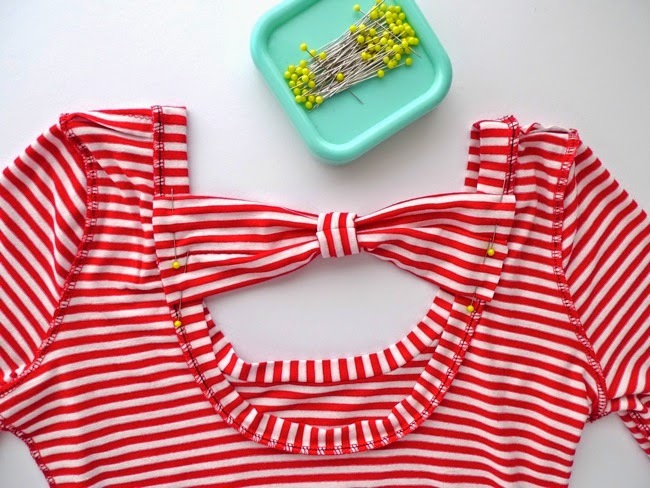 Struggling to get that homemade dress to fit you? Can’t get those self-stitched trousers to sit right? 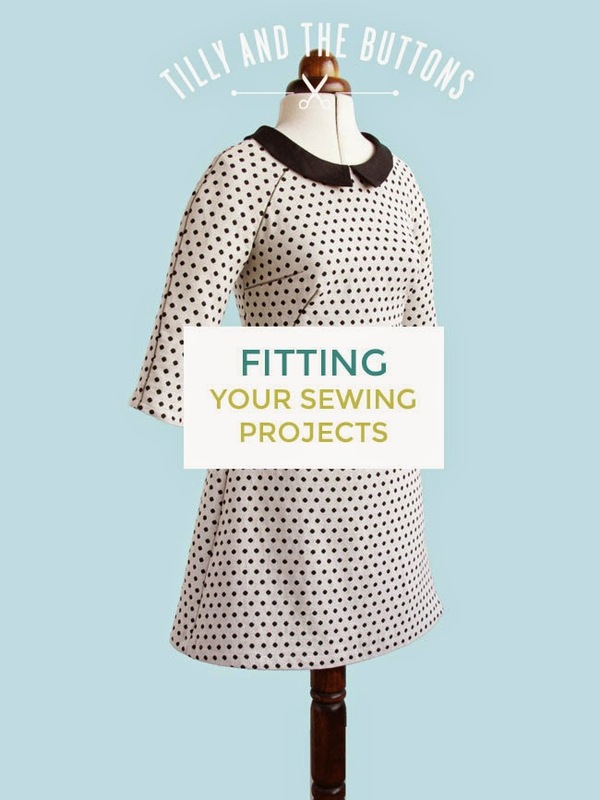 This is a practical workshop for anyone who knows how to sew with patterns, but who needs help with the process of fitting a garment to their body. 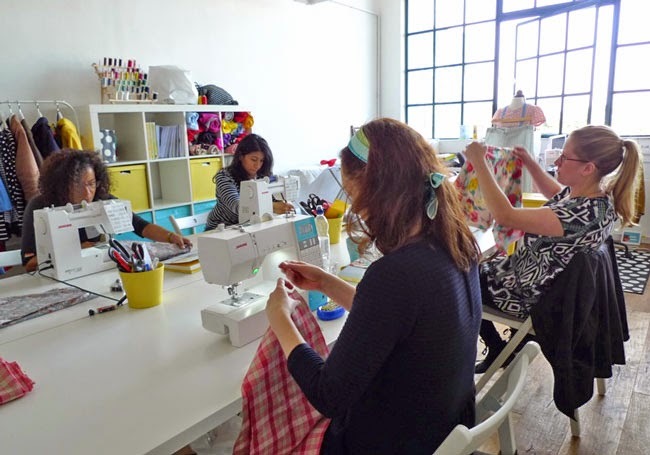 Join a small group of women who, with tuition from an expert in making custom-fit garments, will learn how to get a sewing project of your choice to fit your unique shape. Nafisa Tosh designs, fits and sews bespoke garments for private clients, and for fashion photo shoots for Prada, Calvin Klein, Louis Vuitton, Dior, Lancôme, Pepe, GQ and Rimmel. She has 25 years' experience in sewing and the fashion industry, and has worked for Alexander McQueen, Giles Deacon, Christopher Kane, Antonio Berardi, Jasper Conran, Marios Schwab and Eley Kishimoto. 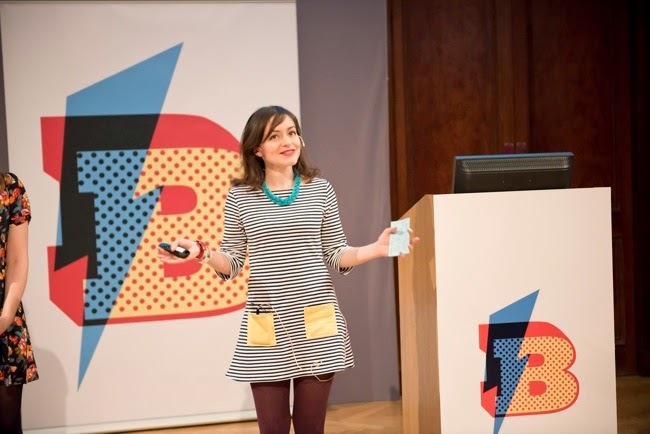 She also teaches sewing at Ravensbourne College and the RCA. As ever, if any of the workshops sell out before you can book your place, drop us a line to let us know you want to come and we'll put you on the waiting list. And if you have an idea for a new workshop that you desperately want us to run, email us about that too - we'd love to know! OMG this blog is five years old today. Half a decade old! Five years ago, sewing wasn’t really a thing that people did - at least, not in the UK, and not in my social circles. When I would tell people that I made my own clothes, they would look at me like I was, frankly, totally nuts. 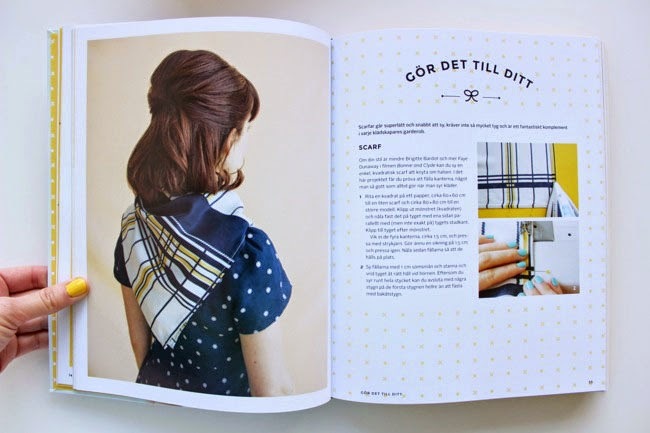 There were only a handful of sewing pattern brands to choose from, mainly aimed at a target audience who were older than me and only one that I found inspiring in terms of style, accessibility or branding – certainly nothing like the choice that we are lucky to have today. So when I discovered there were normal people online sharing their homemade creations, sewing tips and cute patterns, I felt so excited and wanted to join the party! 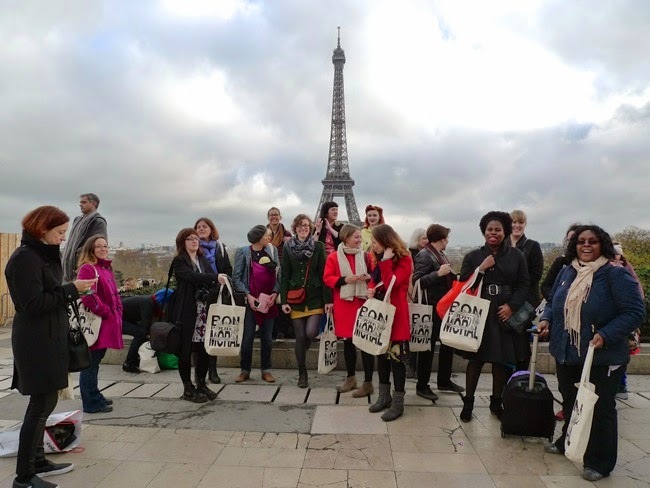 So, on 1 January 2010, I began writing this blog with the intention of sharing my love of sewing and connecting with other makers. When I started, I knew absolutely nothing about blogging, and I certainly never imagined it would become such a big part of my life. But I kept writing, kept learning, and bit by bit this space has evolved, as all blogs should (I like to think for the better). 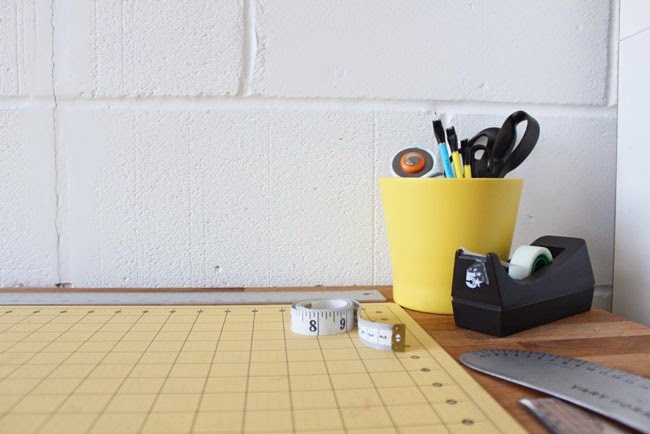 It’s now a place where I share not only my own homemade creations, but also sewing tips, tutorials, design ideas, patterns from my own brand, plus the occasional peek behind the scenes into building a sewing business. 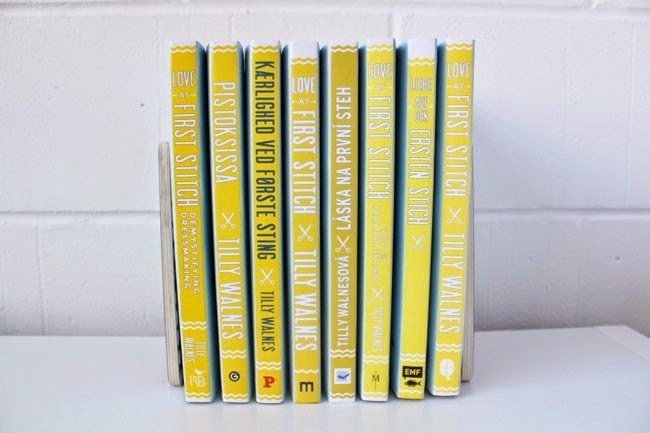 Throughout the last five years, my original intention of sharing my love of sewing and connecting with other makers has remained the same. Gah I still just adore sewing and the sewing community! Isn’t it the best? The last year has been a particularly big one for me, the first full year of working for myself. 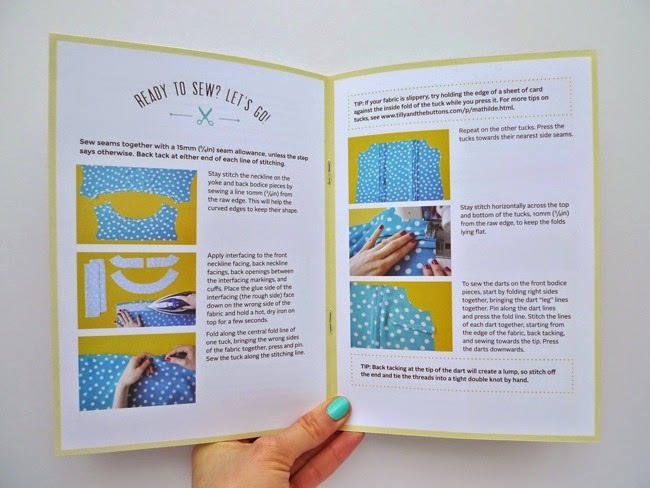 As you’ll know if you’ve been reading this blog for a long time, for the first few years I was sewing and blogging during the evenings and weekends, while holding down a senior management job in the film industry during the week. Gradually over the years, I became more interested in maker culture than in my film career, and I started to realise that what I really wanted to spend all my time doing was making my own clothes for fun and inspiring other grown ups to make their own clothes for fun too. As you know, eventually I plucked up the courage to leave my job and build my own business to do just that. 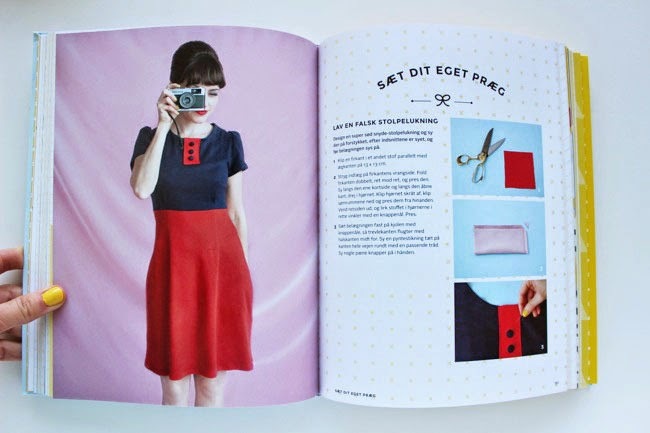 * Launching printed versions of our sewing patterns with gorgeous step-by-step photo instructions, including two new designs – Coco and Francoise – to join Mathilde and Miette. 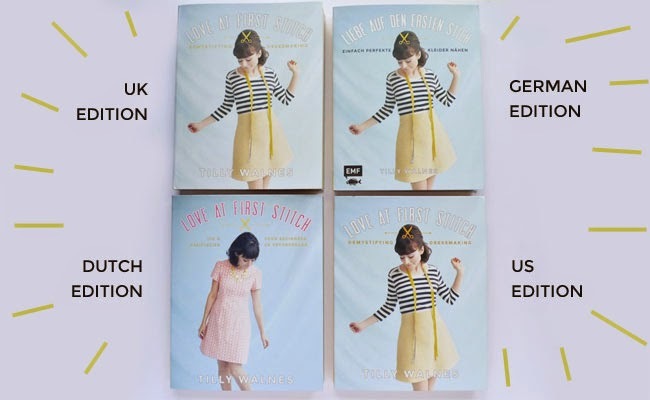 * The publication of my first book, getting onto the Sunday Times bestseller list and having it translated into eight languages (yay for sewing books!). * Getting out and about and meeting lots of lovely people - at the workshops in our studio, at The Village Haberdashery, and for Janome at the Handmade Fair; giving talks on blogging, book-writing and start-up business for Crafty Fox, Blogtacular and the Clore Leadership Programme; at the party that Lauren hosted for my book; doing my first pop-up shop at Makegood, in Selfridges’ basement; and going to Paris with the other Lauren and a whole load of other lovely bloggers and readers! * Behind the scenes, moving the office out of my flat to a gorgeous studio; hiring Laura as the company’s first employee; and starting a partnership with the lovely people at Janome - all of which is helping me to improve what we offer, now and in the future. * Also behind the scenes, overcoming some yucky “challenges” along the way - because, of course, not everything is always rosy - including a major copyright violation (as in, someone literally copied and pasted my website and passed it off as their own business) and a horrible medical scare that forced me to stop working for ten weeks. The lessons learnt from those experiences are that I'm lucky to have awesome people looking out for me, and that sometimes you've just gotta stop working and rest up. You know? * Doing some sewing - I made 14 Cocos, four Francoise dresses, two Delphine skirts, two Nettie tops, one Lola dress, one Picnic Blanket Skirt, one pair of (glow-in-the-dark!) Margot pyjamas, one Bruyere shirt, one Dove T, and a partridge in a pear treeeee. After a whirlwind year I was pretty exhausted in December, but after a restful few days on the sofa I’m now getting very excited about 2015. It’s going to be a good year, I can feel it! I’m planning to create some wonderful stuff to share with you, strengthen and grow the pattern line, and, on a personal level, take good care of myself. Do you have any plans, goals or resolutions? Whether you’ve discovered this blog recently or you’ve been reading right from the early days, whether you’ve ordered something from the shop, have recommended my book to a friend, have sent me a lovely email, or have supported my small-but-blossoming business behind the scenes, I want to say a heartfelt thank you. I’m very lucky that I get to do what I love for a living, not just in any field but in such a wonderfully inspiring, positive and creative community of makers. Group hug! Happy new year – and here’s to the next five years!